How can I trace this error? I found this page which suggests and answer, but I'm not sure if it is the same problem. But I've tried several of these FixRTEBug attempts, all to no avail. After testing various pages, I have concluded that the error only happens in wiki pages. It does not happen on webpart pages containing Content Editors. Wiki Home Pages, Wiki Libraries, etc. 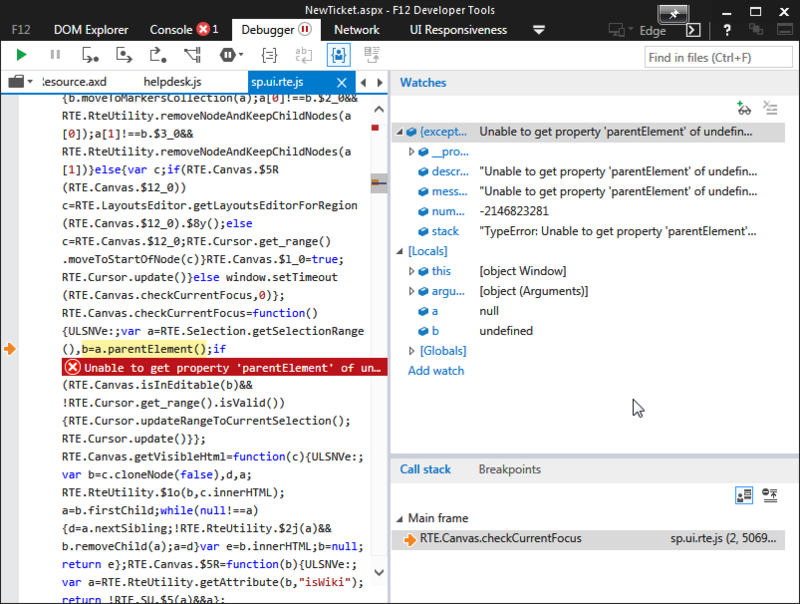 Judging from what the console is saying, it seems that the method RTE.Canvas.checkCurrentFocus fails because the element passed is null and the method doesn't expect it to be, so you get an error when it tries to call null.parentElement since parentElement is not a valid property of the object. Their fix seems to be overwriting the method. Not the ideal solution but if you too are on SP 2010 then that might be the solution to your issue as well. Edit: adding a followup to the comments below.